This 29 years old mother have been affected with a sore, on and off, ingrown toenail on her left big toe for years. Because her calloused nailfolds were pushing up against both nail sides, the nail got finally detached from the toe. This broke away the natural barrier at the distal end of the nail. Then the fungal micro-organisms got right into the open spaces under each side of her discolored and yellowish nail. 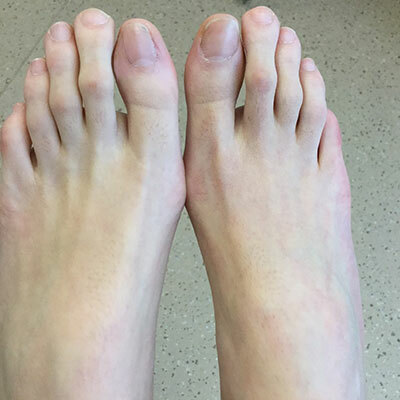 An ingrown toe nail procedure had been performed conservatively enough to preserve the natural outline of her left big toenail and the look of her feet. The immune system of this young lady was strong enough to push away the disfiguring fungal nail infection. Here is the final picture showing how the appearance of her foot, toe and nail had been nicely preserved. At Ottawa Foot Clinic, we take pride in providing you such good looking and fungus-free end-results! Start by disinfecting your shoes each day with a spray or a UV light device. Apply antifungal cream on the skin around the affected nails every day. Set up your first monthly anti-fungal laser treatment at our office. We use two clinically-proven fungicide wavelengths. You may need as many as three or four treatments. We apply an antifungal nail sealant right after the laser session. You need to start now, because even though the laser kills the fungus immediately, it takes a while for the new nail to grow out and replace the damaged one. Depending on how fast your nails grow, this could take a couple of months or more. Each time you trim away the ends, more of your nail will begin to look like normal, healthy tissue once again. The daily antifungal cream and shoe treatments each day will help keep new infections away by killing any new fungus before it can get under your nail and start multiplying. Nail fungus is tough and resilient, so dont stop the home treatment until we can confirm the infection is gone. When you are ready to say goodbye to thick, yellow, crumbly nails, call Ottawa Foot Practice in Ottawa, ON at (613) 595-9700 for an appointment to get the treatment plan started. When you are enjoying the warm sun at Britannia or Mooneys Bay Beach on the Ottawa River without embarrassment this summer, youll be glad you did! Fungal Nails May be Successfully Treated! You may not have hauled out your best warm weather shoes just yet, but summer is not far away. If you want nice-looking nails in time for sandal season, but suffer fromtoenail fungus, the time to start treatment is now. Daily shoe treatment with anti-fungal spray or UV light treatment, so the fungus cant hide in them and keep re-infecting your feet. Daily application of antifungal cream on the skin around the nails, to kill the fungus that might migrate from the skin at the bottom of your feet up to your nails. Monthly nail laser therapy sessions, using concomitantly two clinically-proven fungicidal wavelengths, will destroy the fungal micro-organisms hiding underneath your nail. Application of an antifungal sealant after each laser treatment on the two most affected nails will keep new fungi from re-invading your new healthy nails and will restore a normal and vibrant nail appearance right after thevery first laser treatment. With this protocol, healthy nails should begin to grow out to replace the unattractive infected nail you are seeing now, and once they do, your toes will delight you and not embarrass you. Dont delay and let the problem get worse. Schedule your fungal nail treatment at Ottawa Foot Practice by calling (613) 595-9700 or requesting an appointment on our website. You will be glad you did when you can show off your pretty new nails this summer.